The Smart choice for all your monitoring needs. pharmaceuticals, research, food, and building management industries. Sonicu solutions are reliable, cost effective and easy to deploy. Monitor and manage temperature, humidity, differential air pressure, sound, and more with one cloud-based platform. Protect valuable assets across your entire enterprise with configurable Smart Alarming. Eliminate burdensome manual logging to dramatically improve operational efficiency and pass regulatory audits. Sonicu partners with Amazon Web Services, the leader in cloud computing, to provide a data acquisition, record keeping and reporting, and sensor calibration platform that helps our customers in healthcare, life science, pharma (GxP), and food industries meet the stringent regulatory requirements of Joint Commission, CDC, AABB, AATB, CAP, HACCP, FDA, and other regulatory agencies. SaaS true cloud architecture automates monitoring, logging and reporting without additional hardware or IT systems. Access and alarming from anywhere, to anyone at anytime. Advanced algorithms fight alarm fatigue. Superior security, protection and redundancy. DataSync feature eliminates data loss from power outage or other interruption. Sonicu provides a full array of monitoring solutions for virtually any application and industry. Sound - Sonicu's Sound Management Program pinpoints troublesome noise and shows you how to stop it. Humidity - Maintain proper relative humidity levels in environmentally sensitive areas. Air pressure - Ensure proper air flow and containment for clean rooms, surgical suites and other critical spaces. All digital technology improves reliability, decreases cost and eliminates recalibration downtime. Easy deployment/installation with plug-and-play capability. Sonicu IoT solutions wirelessly bridge your enterprise directly to the Internet of Things and automated smart machines to monitor Key Performance Indicators and improve efficiency and productivity. Eliminate siloed, proprietary monitoring applications with a single-source platform; adapts to any future monitoring application. Pair with almost any commercially available sensor to monitor practically any application. Sensor-to-cloud data transmission requires no additional hardware or IT system. Fully configured, easy to deploy and completely scalable. Solutions for any industry from healthcare to manufacturing. [fa icon="plus-square"] What is the risk to my organization if we choose to not implement automated monitoring? At Sonicu we speak to customers every day about protecting their most valuable assets. Unfortunately, we often talk to organizations AFTER a temperature excursion causes catastrophic product loss. In addition to destroying tangible resources, these events also expose organizations to intangible losses such as damage to brand, reputation and public image. Insurance may compensate for these losses, but it cannot replace important research, ensure drug efficacy or restore an organization’s reputation. Sonicu's advanced alarm handling system is the most capable in the industry. Multiple threshold settings, repeating alarms, tiered escalation, and alarm management tools ensure the right people will know if and when there is a problem. Additionally, Sonicu technology incorporates redundant power backup and data storage for constant, consistent protection. Automated monitoring not only provides superior protection and safety; it also saves money. “Sneaker networks” of staff assigned to manually check, log and report are inefficient and expensive, and we’ve found organization leadership is often surprised to discover the significant number of labor hours saved by transitioning to automated monitoring. Manual processes also increase the likelihood of missing or incomplete log entries, putting successful regulatory audit outcomes in jeopardy. Sonicu will help you sail through compliance audits by automating the logging and reporting process and providing access to historical temperature logs at the click of a button. Sonicu also automates annual recalibration with our simple and cost-effective SNAP calibration program that effortlessly keeps your NIST-traceable calibration certificates valid. Automated monitoring is cost-effective, convenient protection. There really is no other choice. [fa icon="plus-square"] We use manual logging today. Isn't that more cost effective? While it is true that Sonicu requires an initial investment by your organization, most clients are surprised to learn how cost-effective Sonicu monitoring is. In fact, if you are currently walking to each monitoring point and logging by hand, you can expect immediate savings in labor costs alone by implementing Sonicu wireless monitoring. 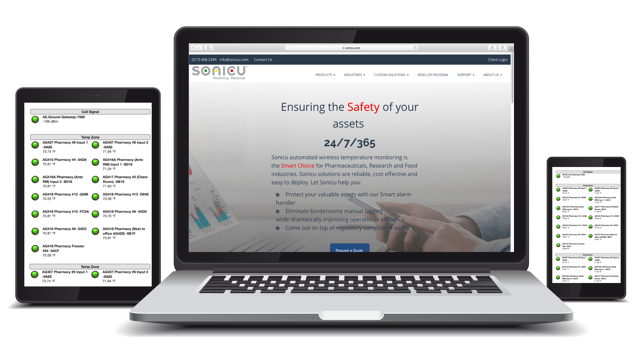 When you add the extra benefits of loss prevention, product safety, and the risk of a failed audit, Sonicu is one of the best investments your organization can make. [fa icon="plus-square"] Is implementation difficult for me and my organization? Sonicu sensors and hardware are plug-and-play and require neither IT resources or expensive retrofitting. Sonicu also offers professional installation on large implementations. [fa icon="plus-square"] Is sensor recalibration needed? If your organization is subject to inspections or audits by any local, state or federal regulatory agency, you will likely be asked to prove that your records are accurate. One of the best ways to accomplish this is by keeping your sensors calibrated to National Institute of Standards and Technology (NIST) guidelines. For many clients, recalibration is expensive and time-consuming. Sonicu's SNAP calibration program allows you to achieve NIST compliance effortlessly. We manage the program and ship newly calibrated sensors to replace sensors with expiring calibration certificates. There is no need to uninstall and ship equipment off-site for calibration or pay the high cost of on-site calibration. When you receive the new sensors, they simply snap into the existing cable. Easy as plugging in headphones to your smartphone. [fa icon="plus-square"] How can this system help me pass regulatory audits? Sonicu's automated logging and reporting eliminate the manual processes that many clients use today. Doing away with hand logging eliminates errors and streamlines reporting requirements for regulatory audits. Sonicu customers can produce years of temperature data with just a few clicks of the mouse. You can say goodbye to clipboards and 3-ring binders! Additionally, Sonicu's SNAP calibration program provides an easy and cost-effective way to maintain NIST traceable calibration for our full line of digital sensors. We manage this program for you so you can focus on core responsibilities. Don't worry, we've got this! [fa icon="plus-square"] Can I expect a good ROI? Yes! In fact, eliminating labor costs associated with manual logging alone will produce a strong ROI in your first year. When you consider the costs of losing valuable assets or regulatory citations, the economic argument for Sonicu wireless monitoring gets even stronger. However, Sonicu's true value is realized through a total cost of ownership analysis. Sonicu is the best in the industry in this regard. Our wireless sensors are plug-and-play and easily mount anywhere in your facility, virtually eliminating installation costs. Sonicu's SaaS-based cloud-computing platform requires no IT resources, network equipment, additional software or maintenance costs for ongoing use of the system. And when you factor in the cost-effective SNAP calibration program, Sonicu monitoring solutions provide the best ROI in the industry over time.